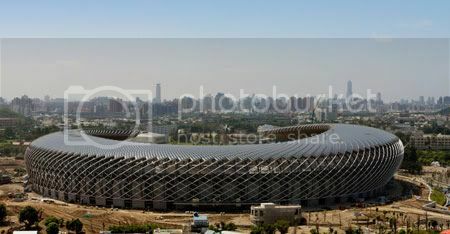 The stunning dragonesque roof of World Games Stadium designed by Toyo Ito is practically covered by 8'844 solar panels, be the first stadium in the world to provide power using solar energy technology. 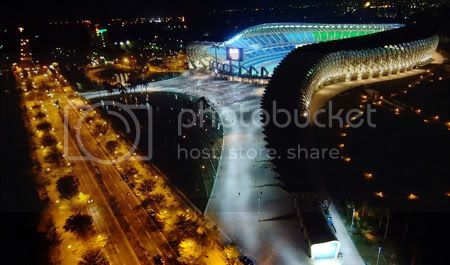 When Kaohsiung was granted the right to host The World Games 2009 by the International World Games Association, the organizing committee immediately launched the venue construction project in order to meet International Federation standards. 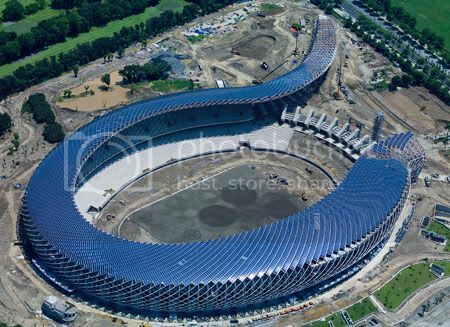 The whole construction of the World Games Stadium, with a capacity of 40,000 seats, designed by Toyo Ito, only required two years of work, and was finally tested for lighting facilities on January 15, 2009. It took over six minutes to power up the lighting in the stadium, which illuminates the track and field with 3,300 lux. Two jumbotrons screens on each side of the stadium, along with a surround sounding system, make this an international standard soccer field and facility, ensuring that it is the perfect venue for the opening and closing ceremonies, as well as the Rugby 7s and Flying Disc events. 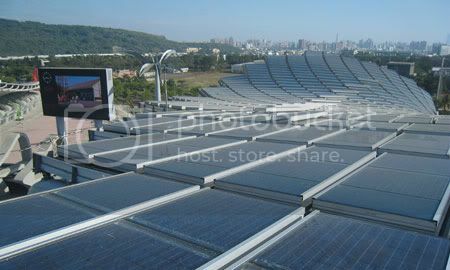 Moreover, this stadium is notable for its eco-friendliness: the solar panels on the stadium roof generate 1.14 million kWh of electricity per year, thus reducing 660 tons of annual carbon dioxide output. 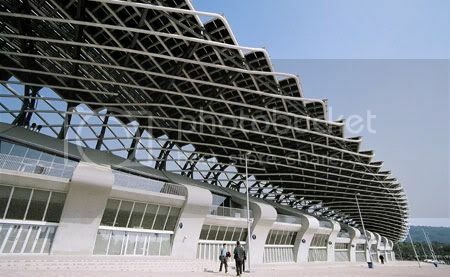 In addition, all the raw materials used in the main stadium are 100% reusable and made in Taiwan. 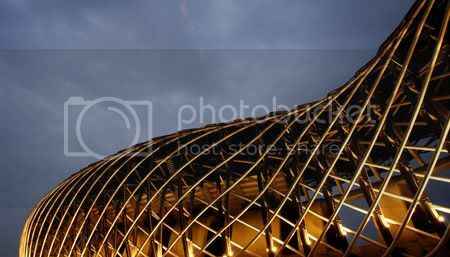 The World Games Stadium is not only a breakthrough of construction techniques, but also different from the traditionally enclosed stadiums; the open design of the stadium signifies a cordial welcome with cheerful greeting. Furthermore, the planning of the stadium is oriented at north-south direction, with a slight northwest-southeast 15-degree angle; the spiral conforms to the open "C" shape of the stadium. 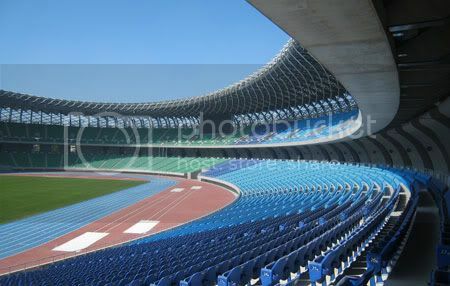 Such design allows the main spectator stand efficiently shelter the field from the southwestern summer wind and the northwestern winter wind. At the same time, such orientation shelters from sunlight, thus providing a more comfortable sport environment. are housed. 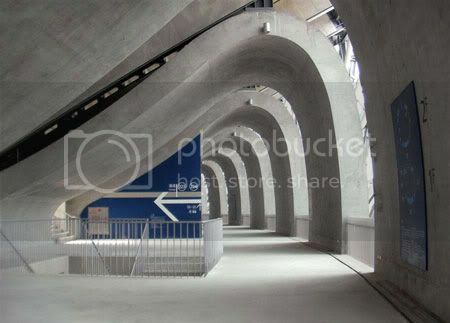 concourses and upper level seating are supported by a ring of concrete structures. The building occupies 19 hectares. Beside the main stadium, the surrounding public area, the planning of the aspects, ecology and sports parks, the integration of the bicycle paths, ecological pond and lush vegetation will traverse the green zone, providing visitors access to the natural environment. Not only does the solar panel system provide electricity during the games, but the surplus energy can also be sold during the non-game period. This is an unprecedented case of solar energy exploit on our island. Awesome information and excellent design you got here! I would like to thank you for giving your ideas and time into the stuff you post.